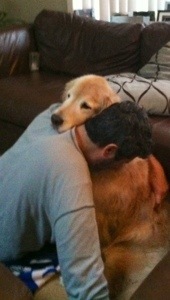 Teva, my sister’s golden retriever, is gone. We had to put him to sleep. About an hour before he took his last breath, I picked him up and put him in the back of the car. We stared into each other’s eyes for a few final moments and then my sister and brother-in-law drove him to the vet. My nephews and I sat home in silence and sniffles. You’d think this would be lost on eleven year olds, but gratefully, it wasn’t. There is love and there is consciousness, and then there is the consciousness of love. All else is an illusion, albeit, as Einstein said, a very persistent one.